3 year warranty replacement on this HID light. After 30 days, the customer ships the failed light to Larson Electronics at their expense. If the failure is a manufacturer defect, we will ship a new replacement to the customer. If failure occurs within 30 days of receipt, Larson Electronics Larson Electronics will provide a return label via email to the customer. When the failed light is returned, Larson Electronics will ship a new replacement. 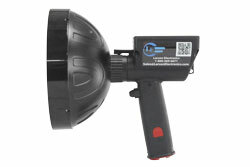 The Larson Electronics RL-85-HID-RED is an extremely rugged and powerful spotlight designed to provide maximum output and complete portability. 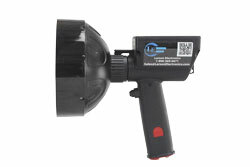 This spotlight is fitted with a red hunting lens and produces a light beam capable of reaching over 1900 feet in length. An included rechargeable lithium ion battery pack provides over 2 hours of runtime and high impact nylon and unbreakable polycarbonate construction provides light weight operation and extreme durability. This light weight and waterproof 35 watt HID spotlight is fitted with a red lens for hunting applications and is ergonomically designed to produce a well balanced and easily managed handheld light source that can withstand demanding conditions and use. The entire unit weighs only 3 lbs 6 oz and is constructed with a high impact nylon handle and lamp housing and a thick polycarbonate lens for extreme durability. The unique lens and reflector design of this unit allows it to produce a high quality spotlight beam with exceptional intensity and long reach without irregularities or lens artifacts. The included red lens makes this unit well suited for hunting predators at night as they are less sensitive to light in the red end of the light spectrum. Users can also lift the locking tab behind the lamp housing and rotate the lamp head to adjust the beam configuration. Rotating the housing adjusts the beam from a wide, soft flood pattern to a tight, spot beam reaching up to 1900 feet in length. Continued rotation to the extreme disconnects the lamp head from the handle assembly, allowing operators to quickly and easily replace the bulb when necessary. Backed by a 3 year warranty, our RL-85-HID-RED rechargeable handheld spotlight is ideally suited for hunting applications and spotting. This units’ reflector is designed to provide maximum efficiency and power by capturing and focusing all of the light produced by the 35 watt HID bulb. The shallow convex lens produces minimal light loss and beam spillage with over 90% of the produced light concentrated and focused. While many typical spotlights lose as much as 50% of their output to light escaping around the lens and creating beam spillage, our spotlight produces a well focused and directed light beam of excellent intensity and power. The 35 watt bulb in this unit is rated at 4500 hours of operational life and produces 15 million rated candlepower. The compact lithium ion battery pack is recharged in 4 hours by an included 120 VAC wall outlet plug in charging unit and provides 2.5 hours of operation. A booted push button switch provides easy one finger operation and the no-slip textured surface of the handle provides a sure grip even in wet conditions. A lanyard attachment at the top of the handle adds further protection against dropping should operators lose their grip. The ergonomic handle is 4.5 inches long, 1.5 inches deep and 5/8 inch thick, and the battery pack casing is approximately 4.5"L X 3.5"W X 2.5"D. The RL-85-HID-RED spotlight is designed for easy field maintenance with simple internal connectors accessed through the snap in base at the bottom of the handle and a lamp housing that is easily removed to access the bulb and wiring. No tools are required to change any part of the light including the bulb and battery pack. We also now offer a 5 inch diameter and a 7 inch diameter lens. Although the difference is not significant, the 5 inch lens produces a tighter spot beam while the 7 inch lens produces a wider coverage flood pattern. Although night vision devices are becoming more popular for some species such as feral hogs, its legality is an iffy subject in many areas, not to mention the expensive nature of equipment of high enough quality for hunting purposes. The most common method of identifying targets remains spotlighting and for good reason; its affordable, its portable, and its effective. With some states beginning to relax restrictions on the use of spotlights while hunting, and certain non game and nuisance animals being added to lists of those that can be hunted with lights, night hunting has greatly increased in popularity in the last few years. 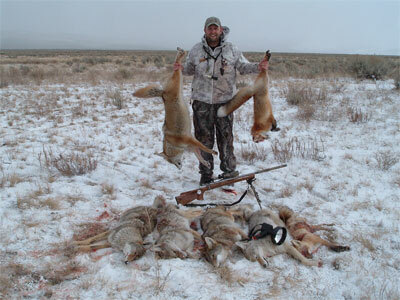 Night hunting on open lands requires some extra consideration if it is to be successful. Unlike hunting in heavy brush or wooded areas, a more powerful spotlight is required since the ranges youll be working with will be greater.